Professional wait staff (waiters, waitresses, servers, bartenders and chefs) are indispensable when planning any event. 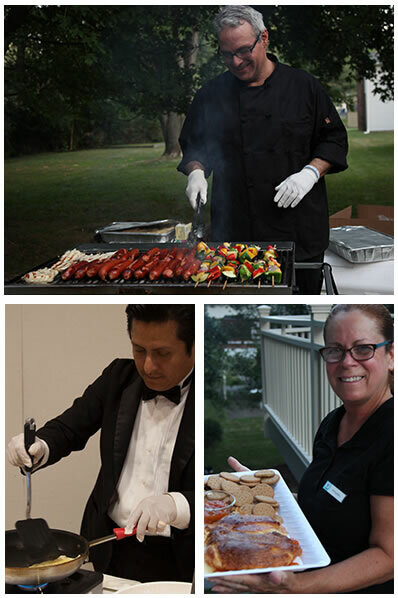 Livingston Caterers offers the experienced staff, know-how, courteous and professional assistance which allows you to "be a guest at your own party" so you can celebrate and have fun – worry free. While you’re off attending your guests, laughing, and making memories, we’ll handle the cooking, serving, and cleaning. Whether your occasion is in-home or at a venue, our servers arrive early to set up for your event. Our staff’s goal is to follow your specific instructions and do things as you want while also bringing in our professional service skills and experience. We only hire the most qualified and seasoned professionals, and ensure that they have each been properly trained and are made aware of any special requests or restrictions before the event. Livingston Caterers wants you to have the most professional and cutting edge service, so you can make a positive, lasting impression.